During a brief hiatus to the excessively cold weather last month, I had the pleasure of heading down to Chellaston in Derbyshire for a gig at the Lawns Hotel to see Merrymaker. High over the street like a small fortress on top of a rocky outcrop; the Lawns Hotel is indeed a hotel (and pub) that has a partnership with a rather pioneering and friendly organisation called Village Folk. 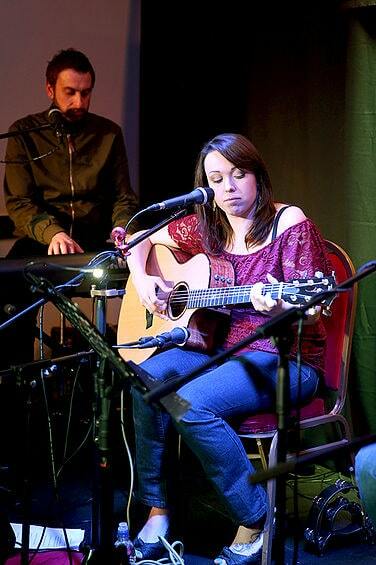 Village Folk is a family (not just in saying, there are family working together here) who host an evening a month with a band or folk artist to bring a little entertainment and heart to the local area. I came across both the band (Merrymaker) and organisers (Village Folk) last year at Derby Folk Festival and situated within the Clubrooms they did a great job continuing the tour de force of Derby known as Winter:Wilson (see their site here). Introducing some newer and lesser known groups and giving them a chance to shine they were a great companion to the main acts in the square and more than the added bonus of being out of the heavy rain that weekend. Relatively new to the organisation of live music, Village Folk are doing exceptionally well. They are getting good attendance and in a time of uncertainty around the viability of live music they are also attracting some recognisable and influential names to their midst (e.g. Sam Kelly soon and Martin Carthy in a couple of months), but it would not work if they were not lovely people with some serious love of the events that they are showcasing. Not a huge venue and also not a folk club; it manages to combine the good running and sound quality of the former with the intimacy of the latter, and it does it well. I certainly have my fingers crossed that they will have an involvement in Derby Folk Festival this coming year! What about the gig? The great urban sprawl of my my younger years always comes racing back when I hear the dulcet tones of Dan Sealey (vocals, guitar) and Adam Barry (keyboard and others) with their West Midlands swagger, a series of sights and sounds never really seen or heard in my now native Yorkshire (much to it’s loss). They were joined by Nikki Petherick (whose accent is a direct contrast, perhaps sounding like an Inspector Morse extra) and Hannah (whose surname they could not decide upon) who brought additional guitar and violin respectively. 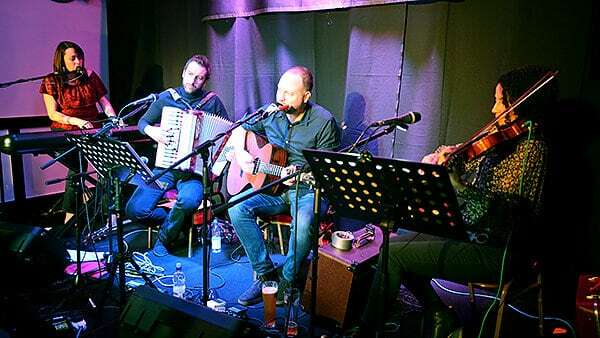 In terms of a general sound, Merrymaker are a kind of entertaining scattering of folk with large elements of acoustic rock, which proves a good foundation for an interesting night out and it makes sense as Dan heralds from 90s rock outfit, Ocean Colour Scene. They have a boyish charm too on stage which is offset to some degree by Nikki giving as good as she gets in retaliation to the guys banter. 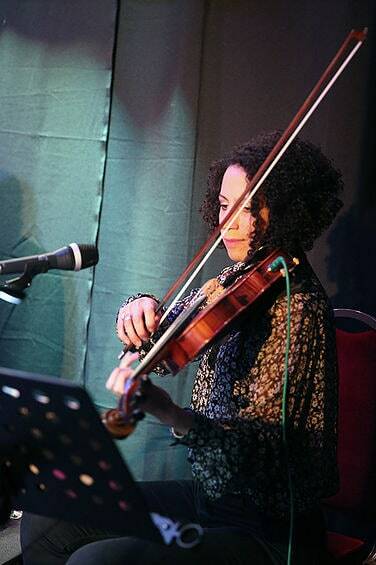 The recent addition of violin is a boon too as Hannah’s classical training brings an extra dimension to Merrymaker’s more guitar heavy numbers whilst also having the potential to bring back the urban rock sound of the 90’s if needed. How would I describe Merrymaker’s songs? Their songs are much like their stage presence in that they often come with a high dose of humour and/or self-deprecation (Adam spent a large amount of the gig concerned with his “fresh from the laundy-but-not-yet-dry trousers” that he apologised for wafting into the audience). This all creates a good environment for their slightly political angle as they performed songs with a focus on Donald Trump (which they played a rather 60’s pop “Coming Up Trumps” that they described as “a stupidly stupid song for a stupid person”) and another about the Syrian Refugee crisis which they curated from comments on Twitter “Nobody Here Wants a War.” With videos of these song posted online they show a versatility in form to their songwriting. The Trump song is indeed “a stupidly stupid song” but it is so good at being it, “Nobody here Wants a War” is more solemn but really well worked from the source material. Merrymaker’s music as a result has a bit of a bite, but rather than the deeper laceration from a jackal it is more like a nip from a well-meaning Brittany spaniel. And while the present world is too much for some, the band also delved into some nostalgia which was to be had from the Ocean Colour Scene days with a slower paced version of “The Riverboat Song” (admittedly not my favourite re-envisioning), and the Stranglers’ “Duchess” (quite good indeed). However they go about things, there is always some sunshine and comedy too. “Midst of Summertime” is a song from their time as the band Merrymouth and it is played in earnest with a really a cheerful, leaping in the rays kind of quality. Once again the violin in it’s live state lifted the track even higher; making it a heather-tinged song that leads to quite a smile. Some might say it makes one exceedingly “merry”. The biggest laughs come from a song about a man having to do chores on a Sunday (because he doesn’t mind what he and his wife does all day, when the amber glow of ale is at the back of his mind) which goes down really well the audience alongside “This is England”, a comedic song with some sober thoughts within. A song about the attitudes of their local pub regular, Roy, who at 88 is miserable and bemused in equal measure by the changes that have happened in society it paints a hilarious but empathic picture of a person that everybody knows. The band unapologetically have fun throughout and this helped by their setlist that combines their political leanings and observations, but also the everyday without a Poe-face to be seen. A great venue, a caring and passionate organisation and a fun, relatable band amount to a good night out. Check out Village Folk’s website for some great upcoming artists here, and for more information about Merrymaker, click here.